Hasbro's Marvel Universe goes beyond a best-of for the comic publisher's rich 40-year history and actually includes figures of what's new and current. With questionable shake-up attempts like "House of M" and "One More Day," the comics publisher brought in evil dopplegangers with "Dark Avengers," and Dark Wolverine is one of the first we've seen. The idea is this: Norman Osborne (the former Green Goblin) pretends to be a good guy, gets government funding, paints Iron Man's armor in red, white, and blue and pretends to be a patriot. An Iron Patriot, if you will. He recruits his own personal (fake) X-Men and Avengers teams, which include Wolverine (actually Daken) and Spider-Man (actually Venom). It's a neat idea. Oh, and Daken's gay. Or maybe bi. Or both. If that's possible. He's also Wolverine's son. The 4-inch figure is pretty well-designed, with about 18 points of articulation. 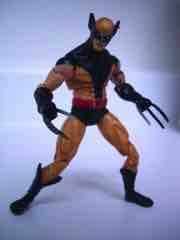 At first glance he looks just like an ordinary Wolverine figure, of which there have been many. A closer look reveals a tattooed arm, and newly sculpted hands have a third "claw" coming out of his wrist. (It looks painful.) He can sit, which means someone at Hasbro actually thought about playing with this one-- a nice change of pace, as many of the Marvel figures have these horrible hip joints which really just seem to get in the way. Evil Wolvie here can sit on the ground with his legs out. This was once standard in all figures, but since the 1990s it has become increasingly uncommon. Score one for Hasbro here. the sculpt is, on the whole, standard issue Hasbro hero in the best possible way. 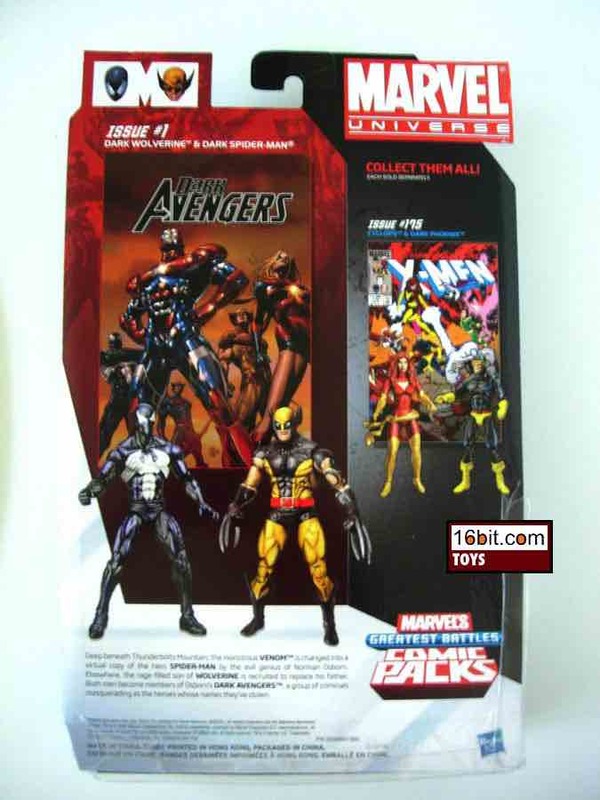 All of the joints are generally free of restriction, plus the recycled bits work-- if you compare the figure to the cover of Dark Wolverine #75, well, it basically matches. I'm no super-expert on the series, but it does seem Hasbro did a good job translating this guy to a fun toy. 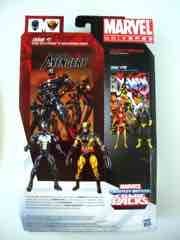 It's certainly close enough to be fun to mess with, even if Wolverine is short and his toys are not. 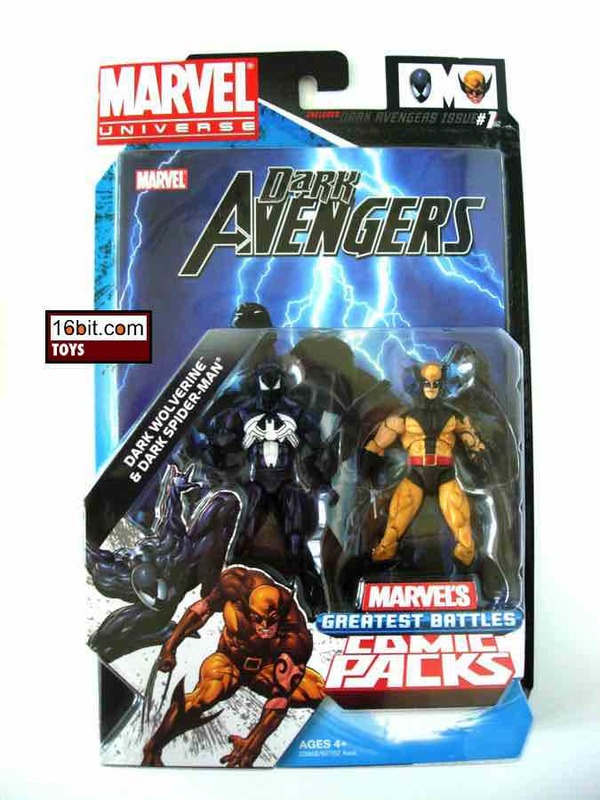 Dark Wolverine is part of a team which, to date, consists of Iron Patriot (normal and unmasked variants) and Venom (Spider-Man, whatever). Dark Hawkeye is due out next, and that's it. It's not entirely complete, but it is a small team and a nice little area on which to focus. 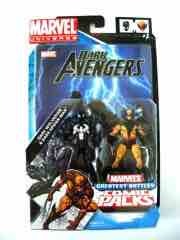 Sure, you could buy the regular Avengers, but these ones are evil with more pointy bits. You just know that means they'll be better. As a random grab, the figure is pretty good. His companion comic doesn't really explain the backstory too much, so unless you're willing to read Wikipedia (or of course, the comics) odds are this will just be another wacky Wolverine to you.